Apple’s latest and greatest mobile operating system, iOS 9, is now available. This isn’t just any Apple OS. It’s the brains inside Apple’s most popular and profitable products, it’s mobile product, especially the iPhone. IOS 9 is a collection of new features and functions that bring Apple devices back into parity with mobile devices on the Android side of the world. For instance, one of the main attractions in iOS 9 is multi-tasking and split-screen functionality, things that have existed in other mobile OSs for some time. Similarly, as you will read below, iOS 9’s personal assistant Siri is getting smarter, and learning some of the tricks we’ve already seen performed by the Google Now personal assistant. 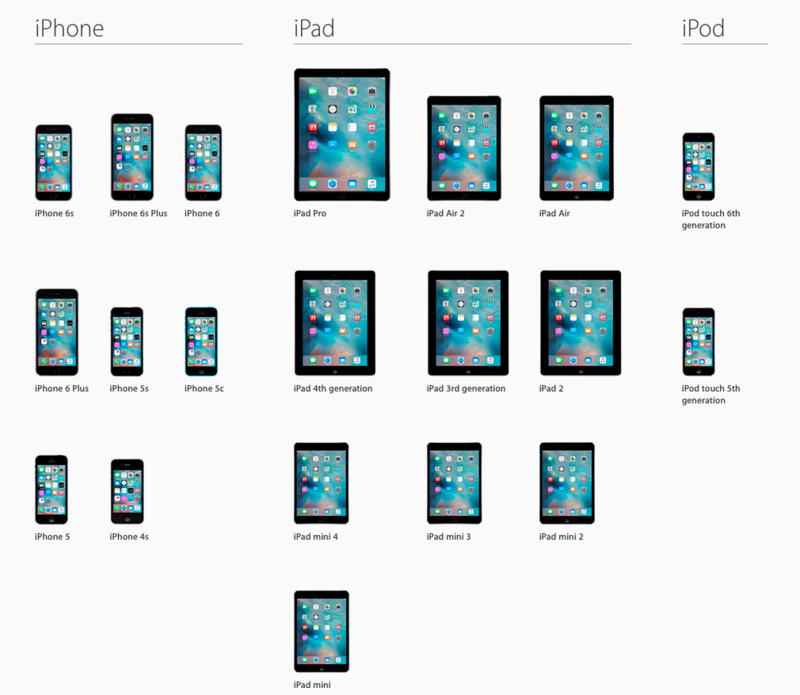 And iOS 9 can be seen as a look into Apple’s vision for mobile computing in the future. IOS 9 will be the last full release of the OS until we see iOS 10 next year. The Apple OS has to offer something more than just parity with Android. One of the marquee improvements in iOS 9 is Siri’s progress in the direction of Google Now. The personal assistant has become better at learning about you and anticipating searches or functions based on your habits and location, as well as the time of day. Siri’s user interface has also changed. It now resembles Siri on the Apple Watch, with undulating lines appearing at the bottom of the screen while it’s listening to you. The personal assistant, I discovered, also has six different voice sounds. You can choose a male or female voice with American, Australian, or British accents. I chose female and British to make Siri sound even more intelligent. One of Siri’s more useful improvements is the ability to search through your photos. If you’re like me, you’ve become more interested in taking pictures as the cameras on phones have improved. I suddenly have a lot of photos. Thankfully, Siri has gotten smart enough to search them by time and place stamp, as in the below search and result. One thing I thought we were going to get with iOS 9 (and still might, I suppose) is the ability to wake Siri up with the “Hey Siri” command even when the device is sleeping. You can do this on Android phones with Google Now. But, at least in my preview version of the OS, the phone still has to be powered on for that to work. Siri came up with the answer to a question about my favorite sports team’s last game. I pointed to this restaurant in Maps, and asked Siri to set a reminder for me. Siri set up the reminder without any problem, and I imagine it will work when I get home tonight. 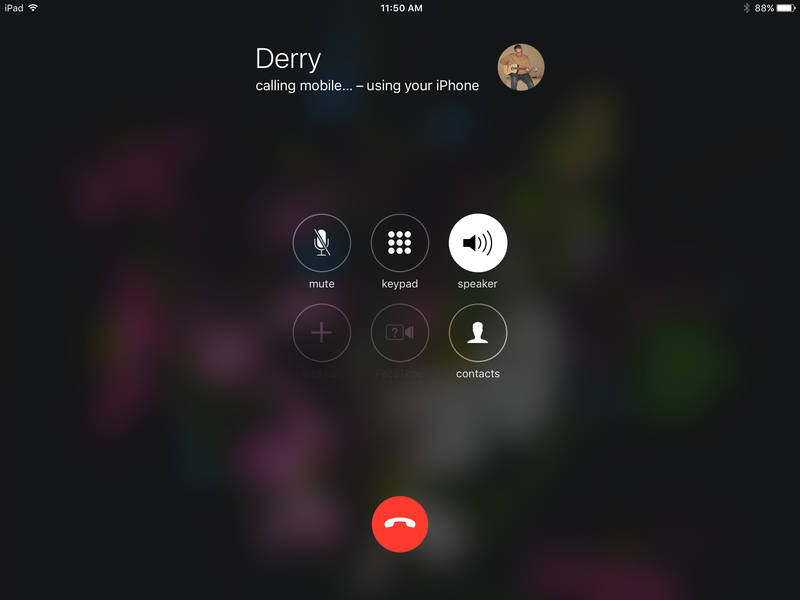 IOS 9 contains a very cool new feature that attempts to help you identify an unknown person calling your phone. When an unknown person (or bot) calls, the OS searches through your email for names that might be associated with the phone number calling. When it finds a possible match, it says “Maybe [person’s name]” underneath the phone number on the screen. Swipe right from the left edge of the screen on an iPhone or iPad, and you’ll see the handy new search screen. The screen has a search bar at the top, and is pre-populated with your most frequently used contacts and apps. It suggests places near your current location that might be useful — like coffee shops or gas stations. These suggested locations could end up being very helpful, especially if you’re in an unfamiliar place. I found that most of the suggested places checked out, and were good suggestions. However, at the top of the list of nearby gas stations in downtown San Francisco was Pacific Gas & Electric Service Center, which, in spite of its name, isn’t a proper gas station, just a big, ugly tan building on Folsom Street. Now, at the bottom of your photo roll, all your photos are represented by small thumbnails that you can move from side to side. When you see the one you want, you simply touch it and the full-sized image appears. Lots of iPad (and iPhone) users have been screaming for multi-tasking, and on the iPad, at least, iOS 9 delivers. In simple terms, iOS 9 lets iPad users open two separate apps at the same time. It does this in three ways — Slide Over, Split View, and Picture in Picture. Slide Over lets you swipe left from the right side of the screen to bring in a narrow view of a messaging, calendar, or map app at the right side of the screen. The slide-out pane isn’t wide enough for a lot of browsing functionality, but it’s enough to look up a word or concept while composing an email in the main screen. 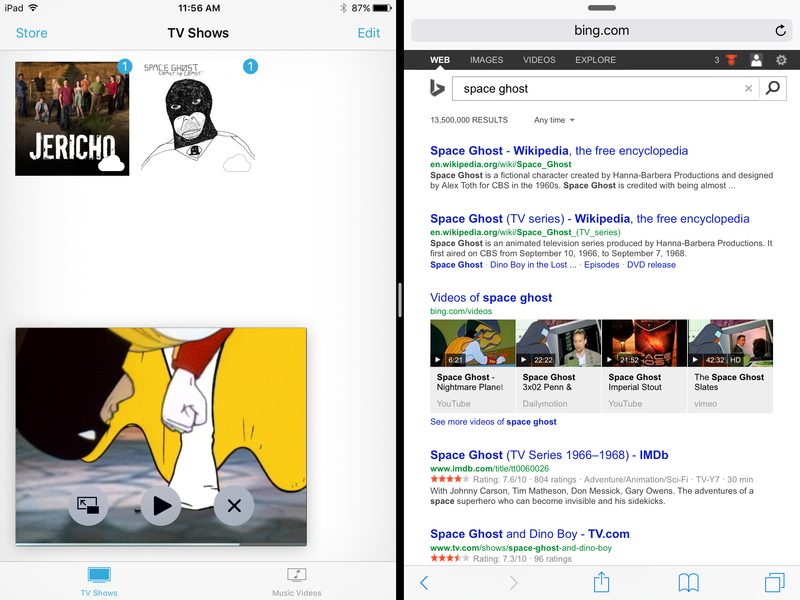 Split View lets you run two apps at once on the two halves of the screen. You can move the dividing line to adjust the relative size of either app. This is useful when you truly need to jump back and forth between two apps to get your stuff done. In the example below I was researching a foreign country, and I wanted to be able to immediately relate the facts I found in the browser to specific locations on a map. The new OS allows you to overlay an (iTunes) video on another app so that you can keep an eye on a live event you may be watching. This can also be useful when you’re supposed to be building a spreadsheet and messaging with co-workers, but just can’t stand to turn off Space Ghost. 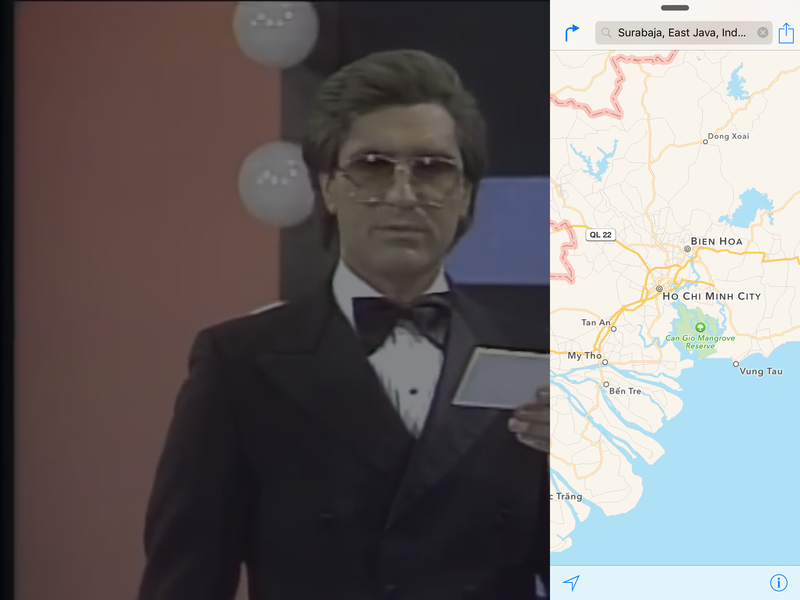 However, when I tried to split the screen between the YouTube or Netflix video app and Maps, the OS would not let me keep the video playing while in Split View. The content is chosen based on the content type and favorite publications I chose while setting up the app. And, yeah, you have to scroll past a few ads. Is there an in-ad ad-blocker app for that? I guess not. Here is the presentation of the content in the News app on the larger screen of the iPad. 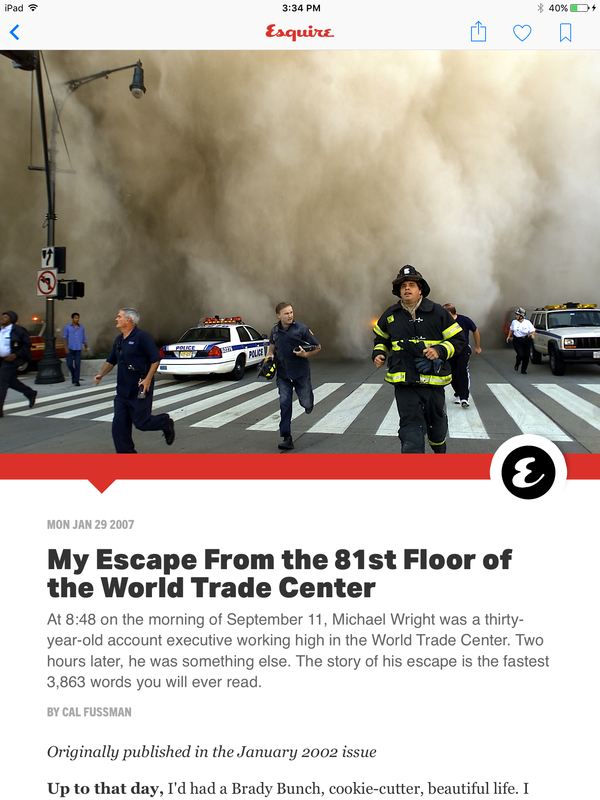 When you choose one of the stories, you see a magazine-like presentation that can make even CNN look stylish. Already stylish publications like Vanity Fair look very sharp. 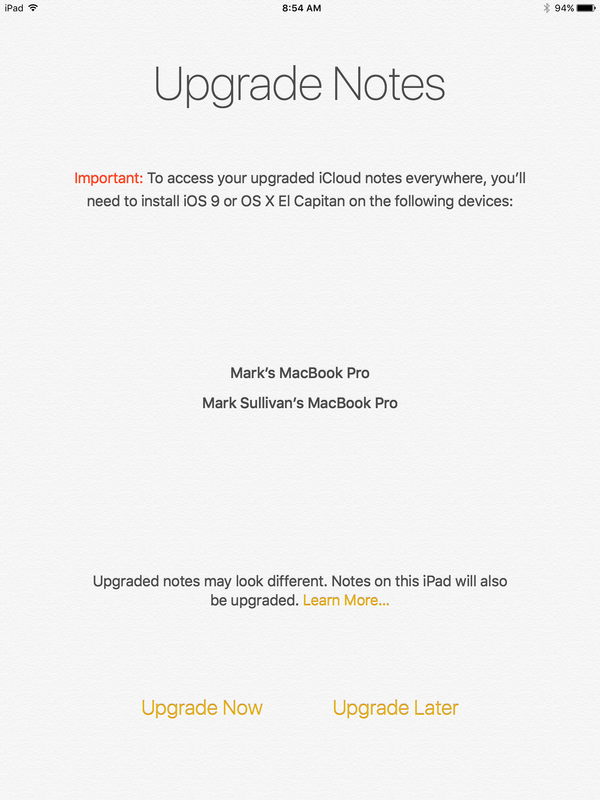 If you have one of these devices you can upgrade . . .